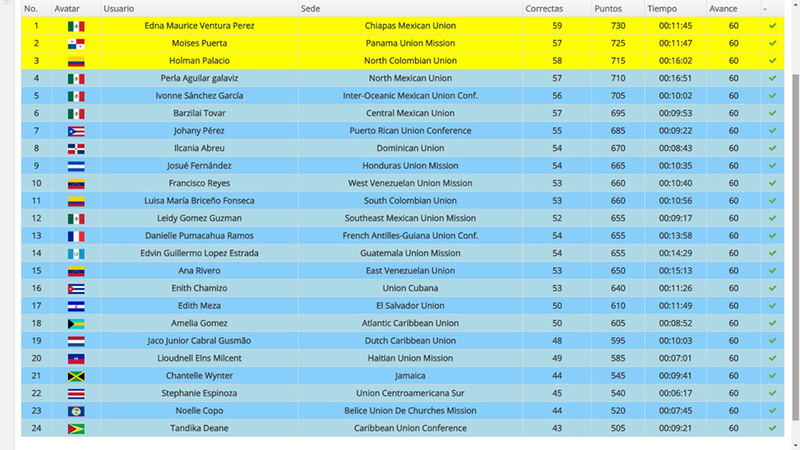 Edna Maurice Ventura of the Chiapas Mexican Union earned the top spot when she beat 23 peers as the grand prize winner today during Inter-America’s final Bible Connection competition held in Belize City, Belize. Ventura scored 730 points after answering 60 questions on the Books of Matthew and Mark, as well as Chapters 6-15 of Desire of Ages by Ellen G. White’s—a co-founder of the Seventh-day Adventist Church. It took her 11:45 minutes to get the top score marking the conclusion of the Bible initiative which has seen thousands of young people across the church in Inter-America studying the Bible in local churches and regional bible competitions throughout the year.